What is the FA-VBS toolbox? This FA-VBS Normalisation toolbox is preparing DTI data for VBM-style voxel-based statistics (VBS) of FA images (FA-VBS). It uses the Statistical Parametric Mapping (SPM8) package, a widely used software for analysing neuroimaging data written in MATLAB. It is based on the spm_normalise algorithm (Ashburner et al., 1999). Fig. 1: Depicted are the three single-contrast registrations that can be combined in the FA-VBS toolbox. Each single-contrast registration will have its own templates, source-images and selection masks. The whole-brain selection mask removes the skull; the hemisphere selection mask removes one hemisphere and the skull. Mohammadi S, Keller SS, Glauche V, Kugel H, Jansen A, Hutton C, Flšel A, Deppe M (2012). The Influence of Spatial Registration on Detection of Cerebral Asymmetries Using Voxel-Based Statistics of Fractional Anisotropy Images and TBSS. PLoS ONE 7(6): e36851 doi:10.1371/journal.pone.0036851. 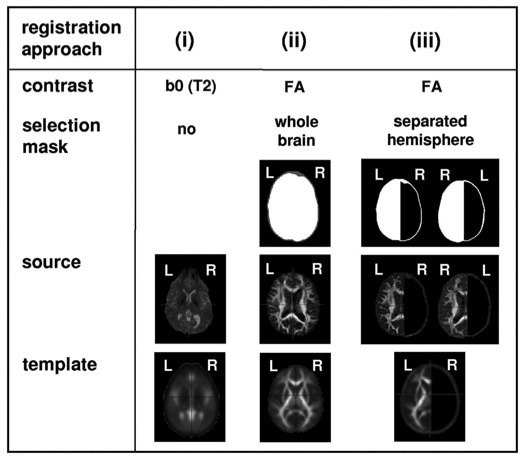 Glauche V, Mohammadi S, Deppe M (2010) SPM normalization toolbox for diffusion weighted images. Proc Intl Soc Mag Reson Med 18: Abstract 1648. Mohammadi S, Glauche V, Deppe M (2009b) SPM normalization toolbox for voxel-based statistics on fractional anisotropy images. Proceedings of the 15th Human Brain Mapping meeting, June 18-23, 2009, San Fransisco, Neuroimage 47: S122. Ashburner J, Friston KJ (1999) Nonlinear spatial normalization using basis functions. Hum Brain Mapp 7: 254-266, doi: 10.1002/(SICI)1097-0193(1999)7:4<254::AID-HBM4>3.0.CO;2-G.